If a nation’s fledgling democracy is in trouble, what should outsiders do? Esther Brimmer examines the effectiveness of U.S. and European responses when other countries’ newfound democratic gains begin to erode. 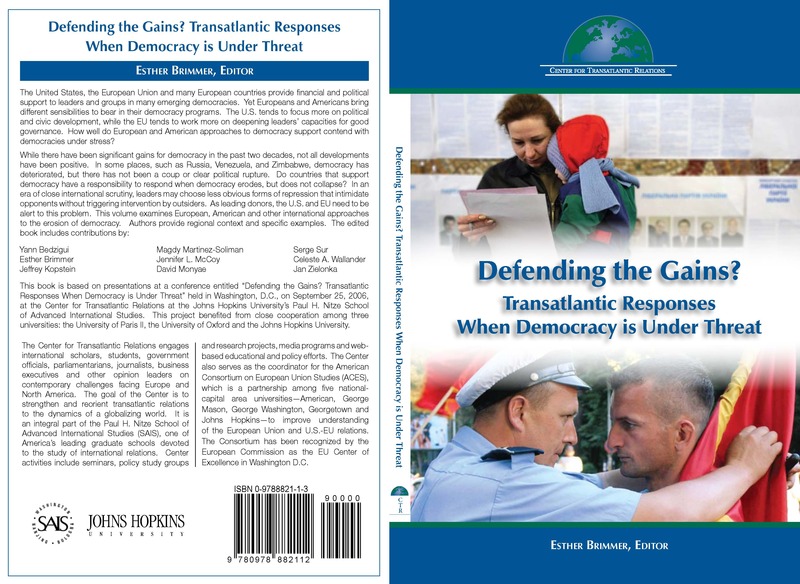 Brimmer asks tough questions about democracy promotion in transatlantic diplomacy. Is it actually helping to deepen democracy around the world? Efforts have focused primarily on ways to encourage democracy where it does not exist, or to consolidate democracy where it has taken hold. But what can and should the United States and Europe do when democracies infringe upon basic democratic principles, or there is a general erosion of democracy? Is there a role for outsiders when democracy is under threat? Should the U.S. and EU support democracy or just stability? Do they need to confront a backlash against democracy or “democracy promotion”?